Valerian and the City of a Thousand Planets: Movie Clip - Who's the Clever One Now? 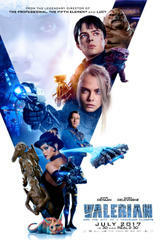 Cara Delevingne, Dane DeHaan, and Luc Besson discuss the impact of their sci-fi action adventure. Looking for movie tickets? Enter your location to see which movie theaters are playing Valerian and the City of a Thousand Planets near you.